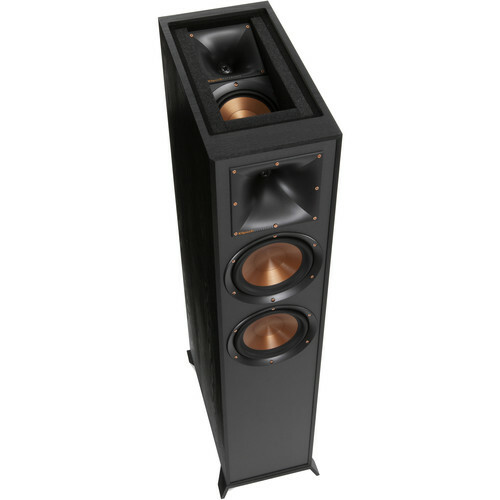 Enjoy an additional dimension of surround sound with the Klipsch Reference R-625FA Dolby Atmos Floorstanding Speaker. It has a two-channel design featuring a top-firing 5.25" IMG woofer and a 1" LTS tweeter, which, when paired with an Atmos-capable receiver and content, generates sound effects that will carom off your ceiling to simulate an overhead source. The front channel has dual 6.5" IMG woofers and a 1" LTS tweeter and accepts up to 100W RMS, while the Atmos channel accepts up to 75W RMS. The built-in, up-firing height channel allows you to create an Atmos system with the front-facing channel and the rest of your speaker system for a more immersive soundstage. The Tractrix horn is designed to ensure that the high-frequency energy is aimed at the listener and to reduce artificial reverb or filtering caused by indirect sound bouncing off walls. This helps to provide enhanced clarity, dynamics, and detail for your music and movies. Linear Travel Suspension (LTS) tweeters help minimize distortion for enhanced performance. Kapton, the material used in the tweeter suspension, is designed to provide high efficiency and augment resolution and detail. Injection Molded Graphite (IMG) woofers are engineered to be light, yet rigid, to help provide enhanced low frequency response with minimal cone breakup and distortion. The rear Tractrix port is matched to the cabinet and woofers, helping to create an ideal airflow with minimal distortion or turbulence, even at low frequencies. This speaker sports a scratch-resistant, textured wood grain vinyl finish designed to integrate into nearly any décor. Box Dimensions (LxWxH) 44.25 x 20.25 x 12.75"